The Bachelor in Banking and Finance with a specialism in Financial Technology is a 3 years degree programme that aims to deliver technical knowledge and skills in handling digital banking and finance products and services. Specialised modules delivered through the programme include introduction on essentials of FinTech, Enabling FinTech, Digital Currencies and Blockchain Technologies, Crowdfunding and Alternative Lending, FinTech Governance, Risk Management & Compliance with the ability for the students to become entrepreneurs in FinTech. Under the collaboration between SuperCharger and APU, the APU SuperCharger FinTech Academy will also be established at APU, to facilitate the research and development in FinTech-related areas. SuperCharger will offer their assistance to students in realizing their FinTech startup ideas, encouraging them to be FinTech entrepreneurs in the future. It is also anticipated that SuperCharger will continue to facilitate guest lectures at APU to expose students and staff towards this emerging industry. Prior to this collaboration, SuperCharger facilitated a guest lecture at APU by Huy Nguyen Trieu (Co-Founder of the Centre of Finance, Technology and Entrepreneurship (CFTE) and CEO of the Disruptive Group) in May 2018, to educate students the importance of FinTech and to provide further understanding of FinTech applications. We are proud to be chosen by SuperCharger to become the first university in Malaysia to launch this programme. Together with SuperCharger, we aim to address the talent gaps in the industry and we look forward to seeing our graduates of this programme contribute significantly to the FinTech industry. The Bachelor in Banking and Finance with a specialism in Financial Technology is expected to commence in February 2019. Graduates in this programme are in high demand, in which they may pursue careers as Financial Analysts, Financial Engineers, Quantitative Analysts, Financial Technologists, Compliance Expert, Strategy Analysts and more. 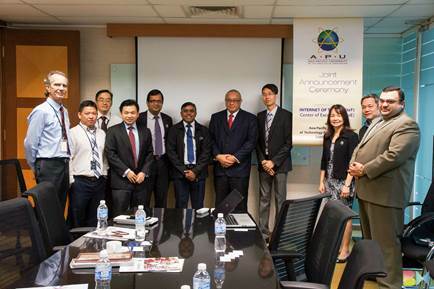 We are pleased to share that APU is now the first university to establish a partnership with the Malaysian Mobile Content Provider Association (MMCP). Under this partnership, MMCP will provide a wide array of career and internship opportunities for APU students, while acting as an industry advisory panel member to provide professional advice in our course delivery and content. In addition, MMCP will work closely with APU Careers Centre and APIIT Corporate Training for other career development-related collaborations. The Malaysian Mobile Content Providers Association (MMCP), was initiated as a platform for all Mobile Content Providers (CPs) to come together under one banner to better address issues raised and ensure the interest of CPs are protected. This includes active participation in discussions/forums/task force with the Malaysian Communication and Multimedia Commission (MCMC), the Consumer Forum of Malaysia (CFM), the Communications and Multimedia Content Forum Malaysia (CMCF), Telcos, the Malaysian government via Kementerian Penerangan, Komunikasi & Kebudayaan and other relevant bodies. We are pleased to hear about this collaboration, we look forward to seeing the fruits of this partnership, that will benefit our students, especially those who are under the Mobile Technology and Multimedia Technology specialisms. It’s time to bring technology to the next level! We are absolutely proud to share that APU is now the FIRST LoRa Campus in Malaysia! Recently, Prof Dr Ir Vinesh Thiruchelvam, Dean of Faculty of Computing, Engineering & Technology (FCET) established collaboration with Semtech Corporation, in which APU Campus will now be equipped with a low-power, long-range wide area network (LPWAN) technology that is designed to meet the demands of Internet of Things (IoT) applications and services by connecting devices, such as sensors over a wide area. Semtech will support APU by providing the LoRa gateway, the technical training and support for LoRa technology. This will be beneficial to our students, especially those who are undergoing the Internet of Things (IoT) specialism, as this provides students with the opportunities to be involved in practical application development within the LoRa network. 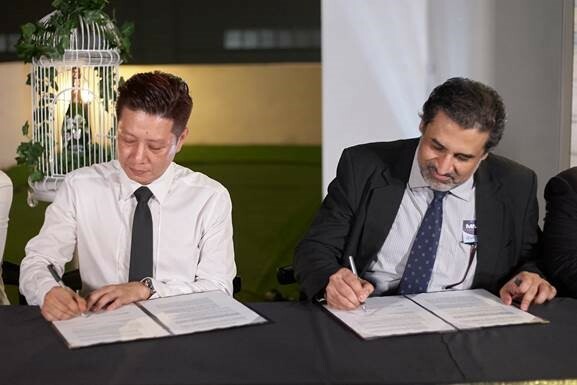 Earlier this month, we signed a Memorandum of Agreement (MOA) with CASUGOL, a Singapore based international certification body, to officially kick-start an inspiring partnership to provide academicians, educators, researchers, and students with the opportunity to receive professional training and get certified in emerging technologies such as Internet of Things (IoT), Machine Learning, Big Data and Cloud Computing. Based in Singapore, CASUGOL is an international certification body offering a wide range of professional training and certification programs designed for all industries and verticals. Courses designed by CASUGOL are constantly reviewed by educators who are industry experts in their chosen field to ensure that they remain current, relevant and consistently high quality. As part of this partnership agreement, CASUGOL will serve as a principal and body of knowledge to transfer knowledge and technical know-how on Industry 4.0 related technologies to lecturers, researchers and students at APU and jointly organise courses, workshops, events with APU to encourage and promote the learning and adoption of industry 4.0 related technologies. This agreement also authorizes APU to incorporate and deliver CASUGOL Official Courseware within its academic curriculum. 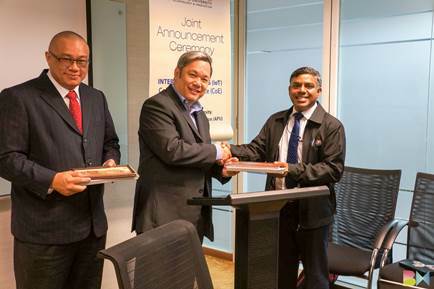 This partnership is in line with the Malaysian Government’s drive to adopt Industry 4.0 which generally incorporates advanced sensors, machine-to-machine communication links, 3-D printing, robotics, artificial intelligence, big data analytics and cloud computing technology. In accordance to APU & IBM Malaysia’s efforts to develop, facilitate and promote the Internet of Things (IoT) education, a Centre of Excellence (CoE) has been established at APU. This first of its kind IoT Centre of Excellence in Malaysia will further extend the power of cognitive computing to the billions of connected devices, sensors and systems that comprise the IoT. Under this establishment, APU will develop, facilitate and promote the IoT education through cloud-based IoT infrastructure used by students, researchers and our faculty members. Concurrently, IBM will also provide relevant IoT resources, training and assistance in building the workforce in APU and equipping APU with current expertise in line with the latest industry requirements, as well as prepare students to meet future industry requirements. The Internet of Things (IoT) is predicted to have an economic impact of more than $11 trillion by 2025. IBM, a global innovation leader in Internet of Things, is working to accelerate the development of cognitive IoT solutions and services in order to help clients an d partners make sense of the growing volume and variety of data in a physical world that is rapidly becoming digitized. The establishment of this CoE will assist APU to create a multidisciplinary learning and research environment in the field of IoT and related disciplines, including Advanced Analytics, Cloud Computing, Mobile Development and Embedded Systems. The establishment of this partnership also brings us forward in learning and delivering the latest technological skills to our students. We look forward to see amazing outcomes of this partnership in the future.